The site extends to 11 acres and is to be developed to provide a range of industrial and warehouse units with B1 office building along the frontage to Park Road. 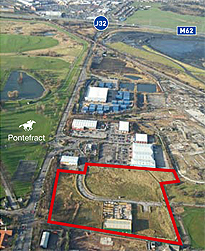 The site is located close to Lunction 32 of the M62 opposite Pontefract Racecourse. Unit 4 has been constructed and let to Travis Perkins Limited. For further details please download the pdf brochure.